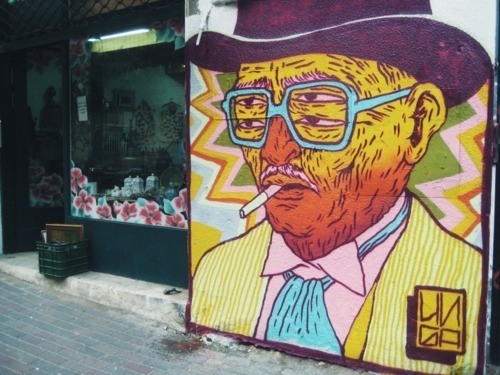 Broken Fingaz are credited with being one of Israel’s first graffiti crews, painting since 2001. 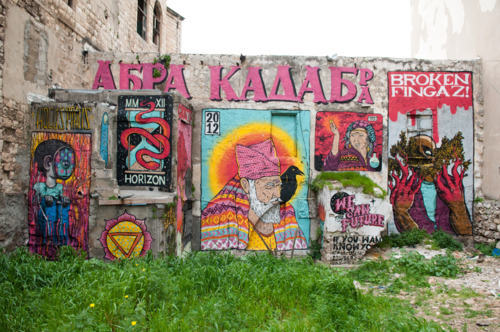 Today, Broken Fingaz mainly work as muralists and illustrators, having become a popular choice to grace the flyers promoting Tel Aviv’s thriving nightlife scene. When I first photographed their work in Tel Aviv a few years ago I was attracted to how weird their work was (and thankfully still is). 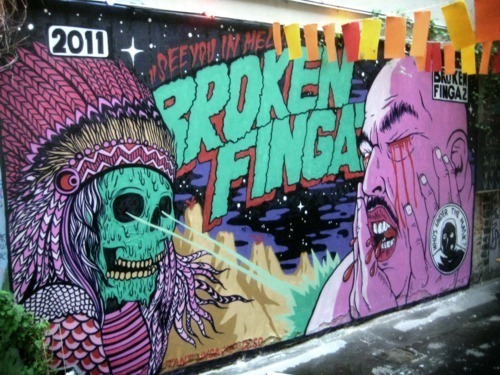 The core of Broken Fingaz is Unga, Kip, Tant and Deso but there’s also a bigger circle that’s expanding all the time. We’ve always painted so it was a natural transition to move into graffiti. It took us a while to find graffiti just because it wasn’t something we saw in Israel. Kip brought a copy of Graphotism on a trip to London and it just clicked. At first we didn’t have any influences, which is why everything we did was so ugly. Later on we were influenced by all the late 90s guys: Dave Kinsey, Mike Giant, Sam Flores, etc. 123 Klan were the first people we saw who combined graffiti and design. Most of the time the first idea for our work is visual: like a picture we have in our mind. From there we develop it, inventing a story. In general you could say our work relates to funky apocalypses, cannibalism, acid, animals and psychedelic experiences! Over time our work got better and it’s still changing all the time. Every year we have a new color scheme. When we started to design it was like there were rules; for example, never put more than 2 or 3 colors together that aren’t in the same scheme. Now we’re as colorful as possible. We hope in the future to go bigger and better. Aside from graffiti we do a lot of poster shows, which is a big part of our style. We do animation, music, and lately we started doing more installation work. There are a lot of writers in Israel (and a lot of talented ones) considering that the country is small and that the scene has only really existed for 10 years. But there are also a lot of imitators; the scene is still young so it is still building its own character. In our city Haifa the police don’t really take much notice of graffiti; they don’t look out for it - they have enough security issues already. The municipality is really vigilant though; they have a special unit buffing graffiti every day. Check out other artists from Israel like Know Hope and Pilpeled (other artists don’t really have websites). Oh yeah, don’t ask us anything to do with politics or religion! We did some cool collaborations in China: people from all round the World were painting in a beautiful venue in Beijing called 798. If we go somewhere and meet people who do graffiti or street art then we always learn from them. In China they still don’t know what graffiti is, so it’s still kind of legal, or at least it’s not vilified, which helps you get away with it. We got caught a few times and it was really scary; they just started shouting and they don’t speak English. I showed them my passport and told them I’m an artist. In the end they let me go. If you’re white and painting in the street, it’s like a phenomenon, people stop and take pictures. Rudi and Charlotte are promoting the BFC show. You can check them out at www.rudes.co and www.no-way.org.uk, respectively.